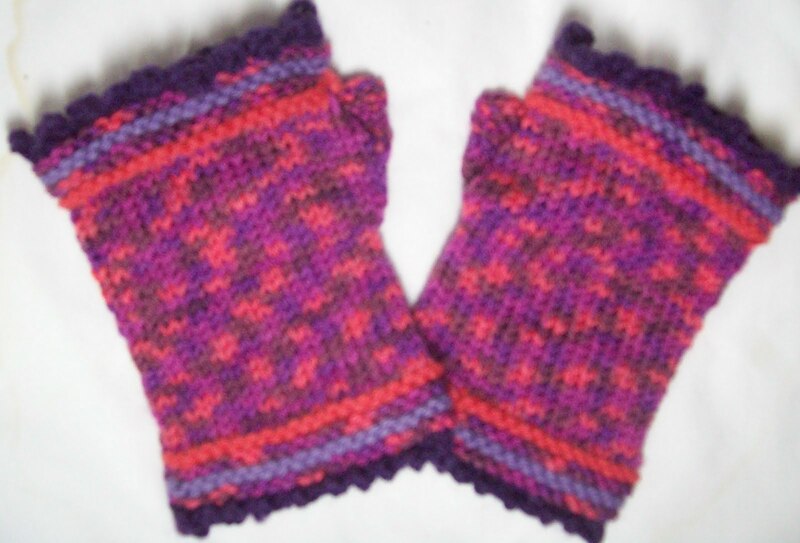 The next time I am short of yarn, I am knitting fingerless gloves in reverse—from the knuckles to the wrist. I have a very small amount of yarn left (enough for perhaps 2 rounds). Two rounds really wouldn't have made much of a difference—the gloves would still be short—but I do hate wasting the small scraps of yarn! One glove (the right one) is finished—the left needs a half dozen ends woven in—quick work. And then there is the baby sweater to knit. I haven't even looked through my stash of washable wools.. but I know I have some brown, and white, and light teal blue. But once I look, who knows, I might find something I've forgotten about. I think some of my stash of sock yarn is going to be used for a baby hat—my syncopated rhythm ribbed and cabled one. With a doubled brim, that a nice warm hat—a good choice for a winter baby. And the ribbing makes one size fits all—Jennifer is tall, and has a big head—she might not have a baby with a bowling ball head—but... Besides, baby's heads grow quickly. OK—enough for now. (It's late, and I still haven't had breakfast! There is a banana and some yogurt calling my name! )Back much latter than I thought—my camera didn't want to work.